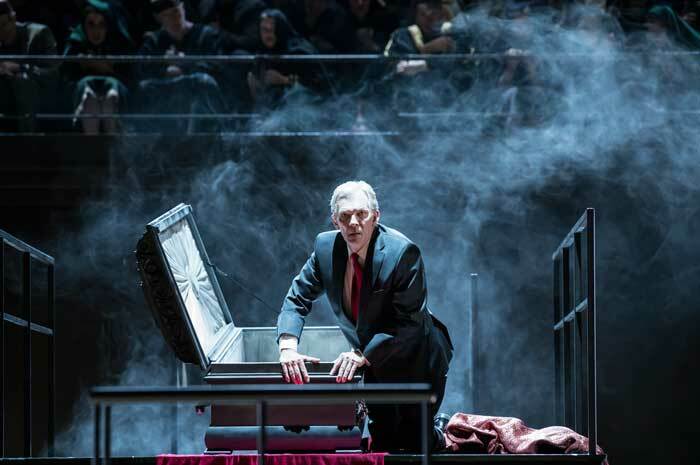 Photographs by Bill Cooper, courtesy of the Royal Opera House. This was the first production of the opera at Covent Garden since 1887. Alan Jackson saw the performance on December 4 and has contributed the following review. Rossini's Semiramide is long. 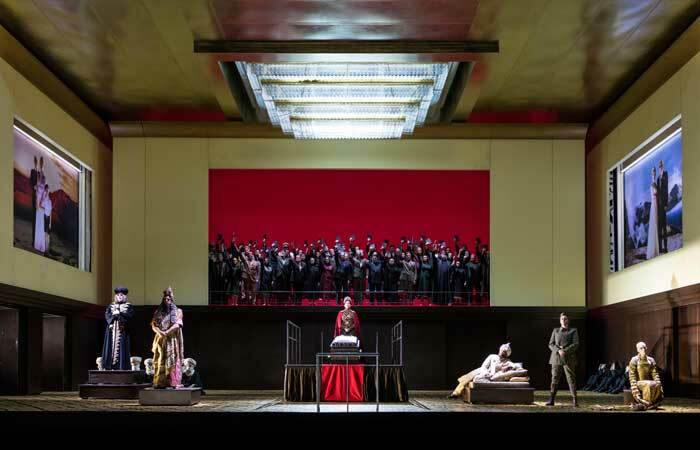 Here there was nearly three and a half hours of music (more on this below) and Rossini’s large musical structures can easily become very static, placing problems for the director if we are not to feel we are witnessing a concert in costume. It demands great singing, buoyant yet dramatic orchestral playing and sympathetic conducting. First, the singing. Covent Garden had assembled as fine a cast as exists today. 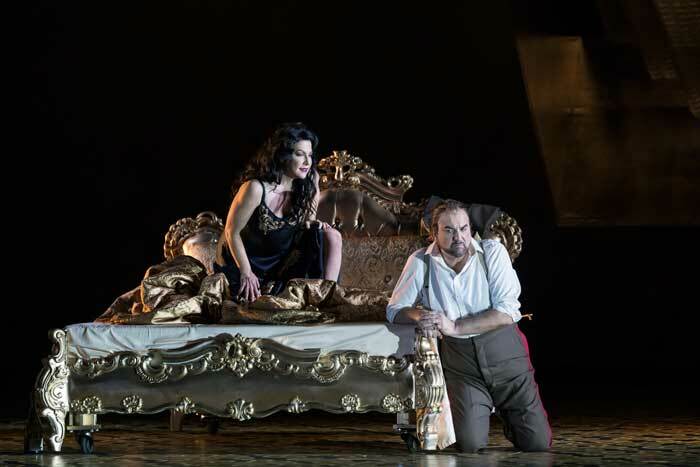 Joyce DiDonato in the title role certainly commands the coloratura and the changing emotions. Sometimes I thought she took passages too fast. Just because she can doesn’t mean she should. So the end of the cabaletta to Bel raggio was hectic rather than joyous, and sometimes the speed seemed to necessitate lightening the tone which then was submerged by the orchestra. 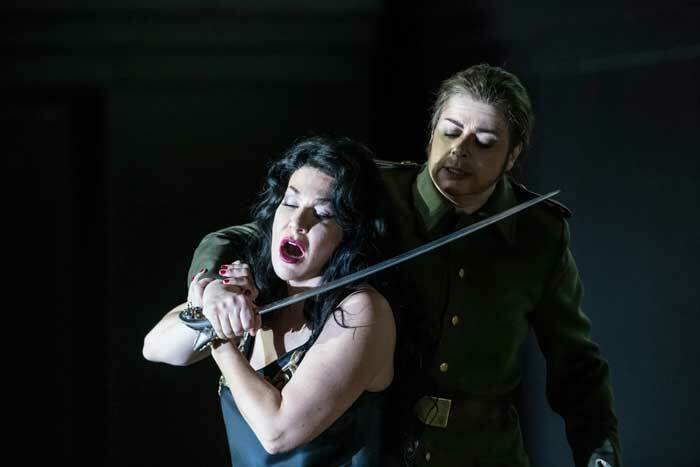 Arguably DiDonato’s mezzo is closer to the voice of Isabella Colbran (the first exponent of Semiramide and Rossini’s wife) than were those of the famous sopranos who have sung it in modern times (Sutherland, Caballé, Anderson), but I did miss the contrast with Daniela Barcellona’s Arsace. She too commands the coloratura and her height makes her believable as Rossini’s male characters. Has her voice loosened a little since I heard her some years ago in Pesaro? I also missed the strength that Marilyn Horne brought to her descents into the baritone range. But for both singers these are trifling criticisms in the face of so much that was simultaneously stunning, and moving. 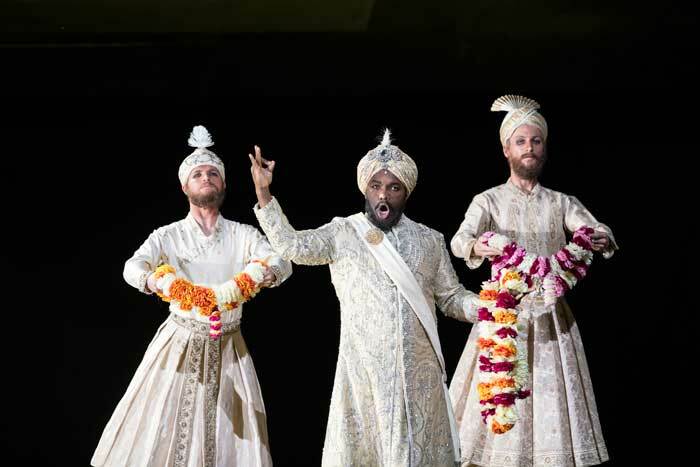 The Indian Prince Idreno was sung by Lawrence Brownlee, gorgeously costumed in white. His high notes pinged excitingly and most if not quite all of the fioritura was articulated clearly. His character is somewhat peripheral to the main plot. Central is the villain Assur who poisoned King Nino before the action started; the poison was prepared by Semiramide herself, hence the guilt and the power struggles that underlie the story. Michele Pertusi was disappointing, the voice sounding woolly, floundering among Rossini’s roulades but perhaps he was still suffering the problems that caused him to abandon the opening performance after Act I. Nonetheless his Mad Scene was affectingly acted. Bálint Szabó as the High Priest Oroe similarly had articulation problems. Smaller parts were well taken though they present few opportunities. Antonio Pappano conducted with fire and except for a few string phrases in the Overture, the orchestra and chorus responded with precision. The production team was David Alden (Director), Paul Steinberg (Sets), Buki Shiff(Costumes), Michael Bauer (Lights) and Beate Vollack (Choreography). The setting was largely modern, with a gigantic dictatorship-style statue of the late King Nino and wall photos suggesting today’s political leaders. 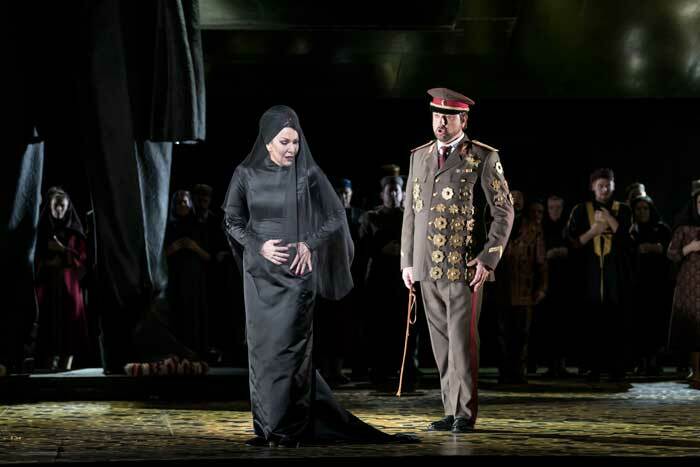 I have to admit that when an opera contains, as Semiramide does, divine interventions and oracular pronouncements, I have more difficulty taking it seriously in a modern setting than one in an age when I can more easily believe that superstition was rife. Alden’s "ideas", such as having a young Arsace on stage as well as the adult Arsace (his entry from behind a sofa was comical) and much crawling around and walking on knees irritated me. As did the treatment of the Princess Azema, dressed in some sort of golden straightjacket, which necessitated much flailing of arms and being carried on and off for entrances and exits – think stereotypical firefighter and rescuee. Though she has virtually no solo music, she is genuinely desired by Arsace and Idreno and politically by Assur, none of which made the slightest sense. Generally I find choral choreography out of place in serious opera, however delightful it can be in comic works, and nothing here challenged that view. But the stage picture was never boring and Alden obtained first-rate acting from his principals. 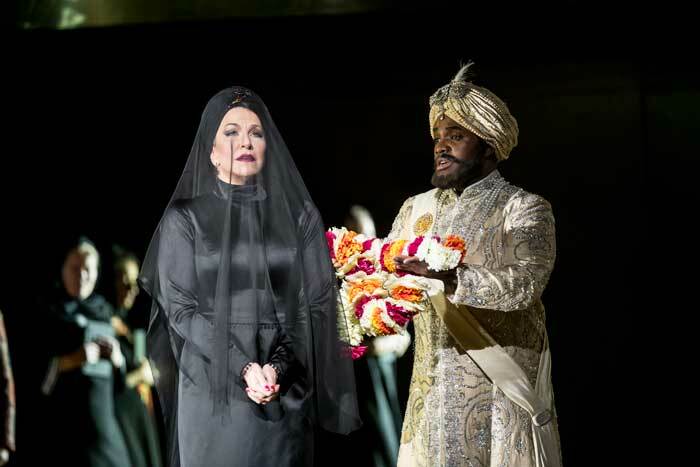 All the big duets (two for Semiramide and Arsace and those for Assur with both Semiramide and Arsace) were highly successful with meaningful gesture and above all, respect for the music which was allowed the space in which to make its emotional impact. The Act II duet for Semiramide and Arsace was the highlight of the evening, both vocally and dramatically. The slow section “Giorno d’orrore!” was received with rapt silence. One of the reviews I saw (Hugh Canning in the Sunday Times) estimated cuts lasting some 55 minutes. I was conscious that a number of cabaletta repeats were missing, regrettable in principle, but understandable outside a festival performance. Two cuts did bother me though. The first was the repeat of the stretta to the Introduzione, or more accurately, its first statement as what we heard was DiDonato’s decorated rendition. The second was the complete cabaletta to Idreno’s first aria, which was a jolt, as if we were left in the wrong key for the continuation. Would it have been better to cut the whole scene? 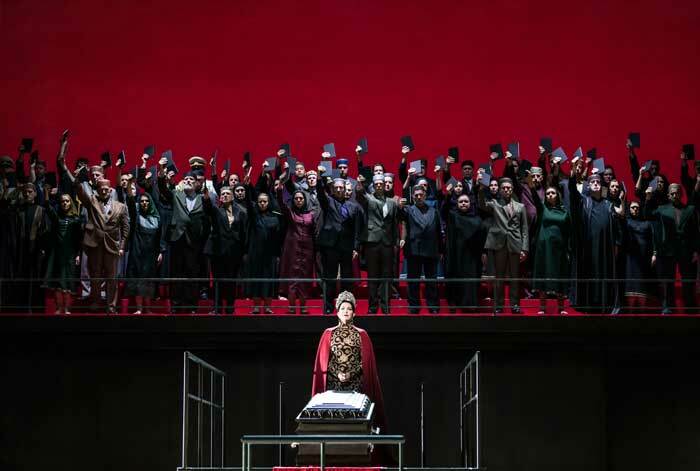 All in all, the positives outweighed the negatives, and I was pleased to have seen the opera again, even if the feeling lingers that I would enjoy it just as much in a concert performance.